Create extrusion effects that have configurable bevel effects on the base, corners and tops. If you have a new feature suggestion or feedback on the add-on feel free to contact me through this website, visit www.markkingsnorth.com, or contact me through Twitter @markkingsnorth. Change the overall number of segments for the extrusion. In Weight mode, change the overall bevel weights on the edges and corners of the extrusion. Q: Increase Top bevel amount or weight. A: Decrease Top bevel amount or weight. W: Increase Corner bevel amount or weight. S: Decrease Corner bevel amount or weight. E: Increase Base bevel amount or weight. D: Decrease Base bevel amount or weight. R: Increase bevel taper amount. F: Decrease bevel taper amount. 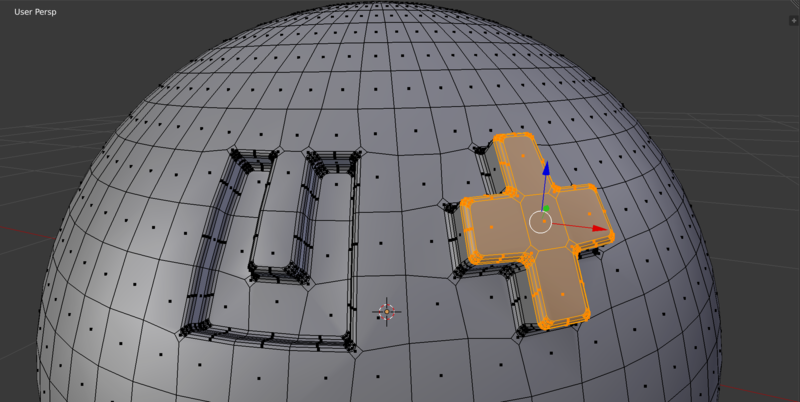 T: Change the mode of the bevel between Amount and Weight mode. I have added small step control to the parameters, so that when controlling the parameters with your mouse you will have smoother control. As this is a new feature, if you have any questions or issues with it do get in touch via Blender Market, my website or on Twitter. Search for the add-on by typing "Bevelled" in the search box if it does not already appear. 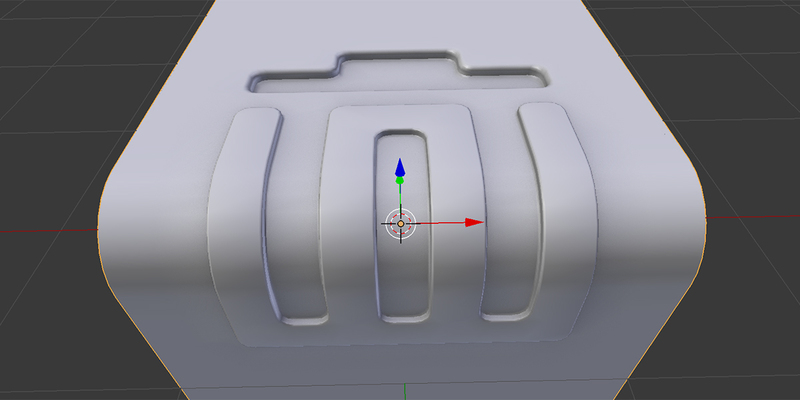 Make sure the checkbox next to the Add-on (Mesh: Bevelled Extrude) is ticked. The bevelled_extrude folder should be created within this directory. 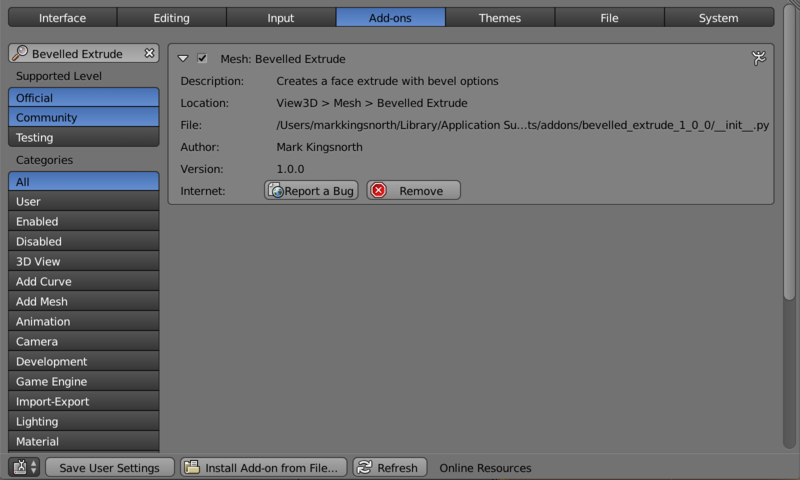 In face edit mode, first select the faces you wish to add a bevelled extrude to. Bevelled Extrude: Execute the Operator just by manually changing the paramters. Bevelled Extrude (Interactive): Control the initial extrusion via the mouse and keyboard shortcuts, and change the parameters after. The parameters will then be remembered next time you use the operation (apart from the height which will be reset). 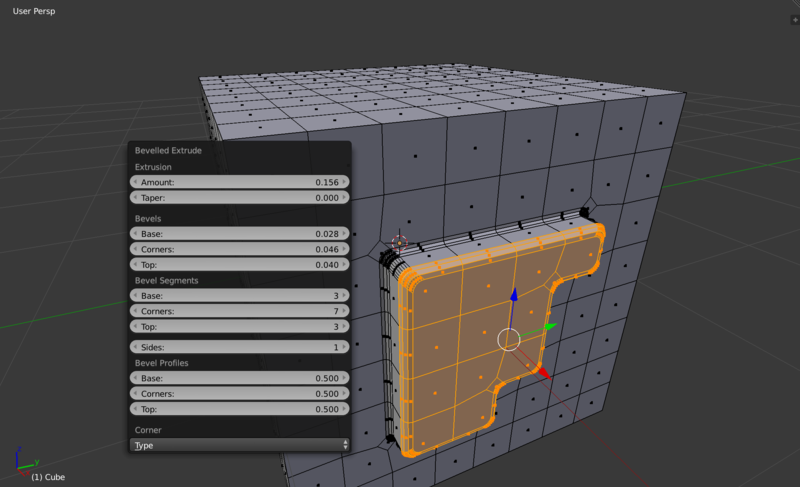 Navigate to Mesh -> Extrude in the Object menu of the 3D viewport. Both Bevelled and Bevelled (Interactive) will be available as options. This Extrude sub-menu is also accessible by pressing Alt-E.
Press the comma (,) key to execute the Bevelled Extrude (Interactive) mode automatically. 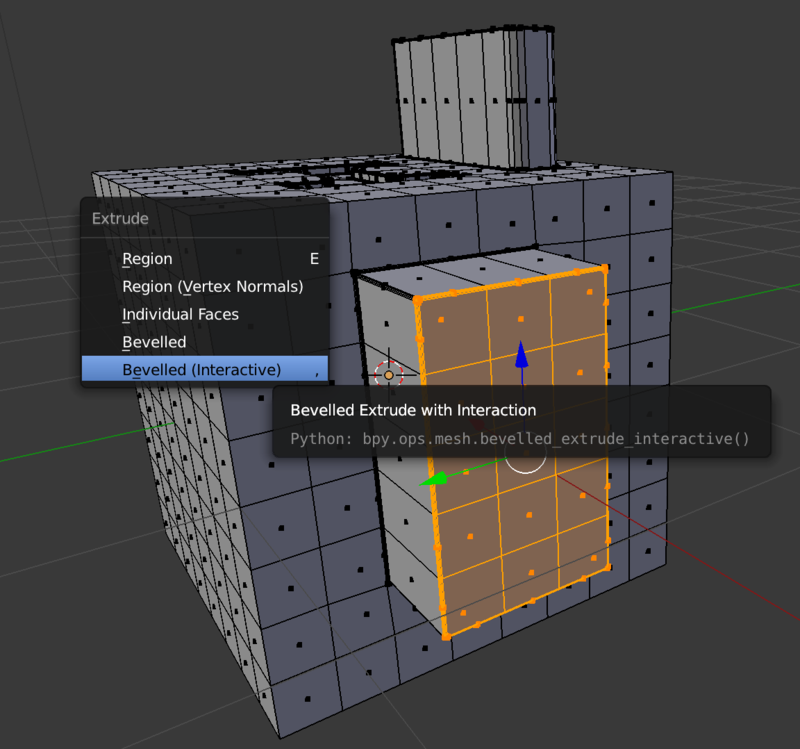 Press Space and start typing "Bevelled Extrude" and the menu options will appear. 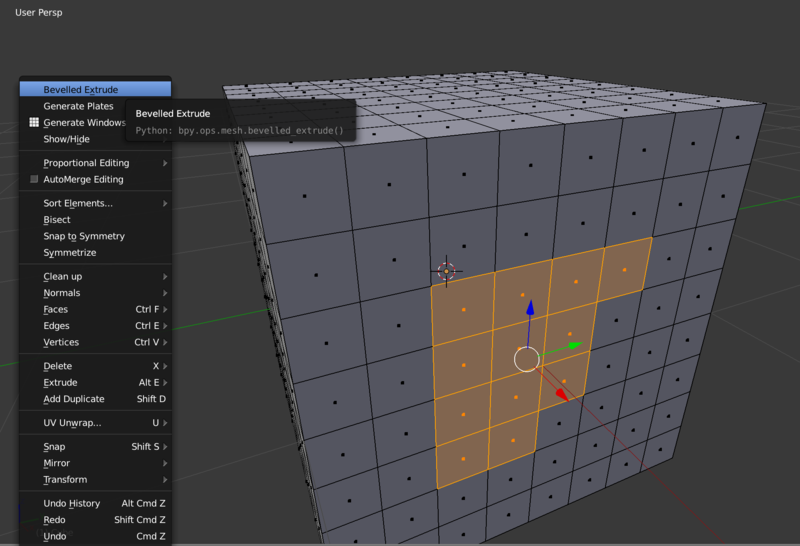 The configurable parameters should then appear as a panel in the Blender toolbar. Try pressing t if it does not appear. Below is an outline on how the add-on works and then a more detailed list of all the configurable options. Base: The surrounding base edges of the extrusion. Corners: Each 'corner' of the selected faces can be bevelled. A corner is defined as when two edges share a face. Top: The surrounding top edges of the extrusion. The add-on can optionally apply bevel weights instead, which can be used with the bevel modifier to be less destructive. Amount: How much the faces are extruded by. Can be negative or positive. Taper: This allows you to reduce the thickness of the extrusion. The Bevel parameters have two modes, Amount and Weight. The Amount mode changes the mesh directly. Bevel Amount: These control the amount of bevels individually for the Base, Corner, and Top. Bevel Segments: This controls the number of segments on the Base, Corner, and Top of the extrusion. As per the standard Bevel Documentation: This is a number between 0 and 1 that controls the shape of the profile (side view of a beveled edge). The default value, 0.5, gives a circular arc (if the faces meet at right angles). Values less than that give a flatter profile, with 0.25 being exactly flat, and values less than that giving a concave bevel. Values more than 0.5 give a more convex profile. This controls the profile of the bevels on the Base, Corner and Top of the extrusion. 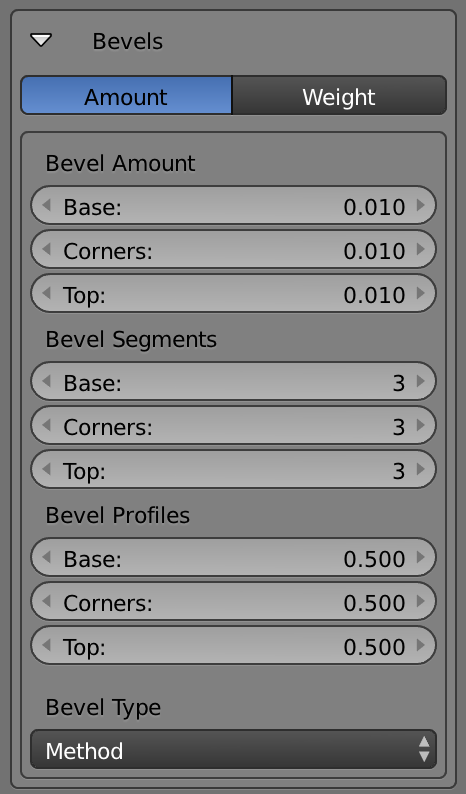 Type: Selects how the Amount values controls the size of the bevel. See the Bevel Documentation for the different options. 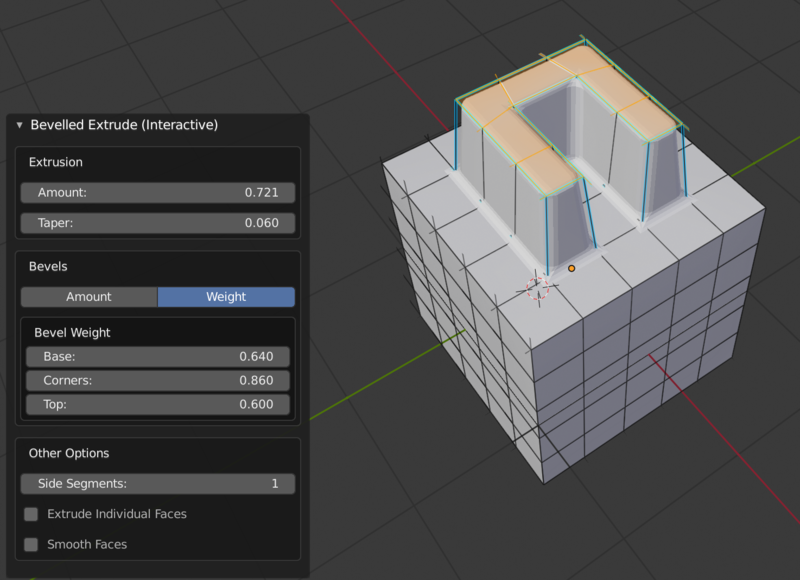 Weight mode applies weight values to the extruded edges and does not edit the mesh directly. 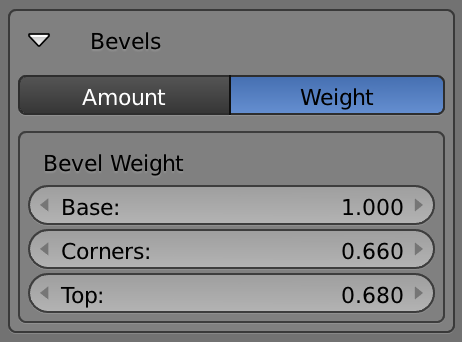 These weight values can then be used with the Bevel Modifier in 'Weight' mode so that the mesh can be changed non-destructively. Base: (0-1) the strength of the bevel modifier's effect on the base part of the extrusion. 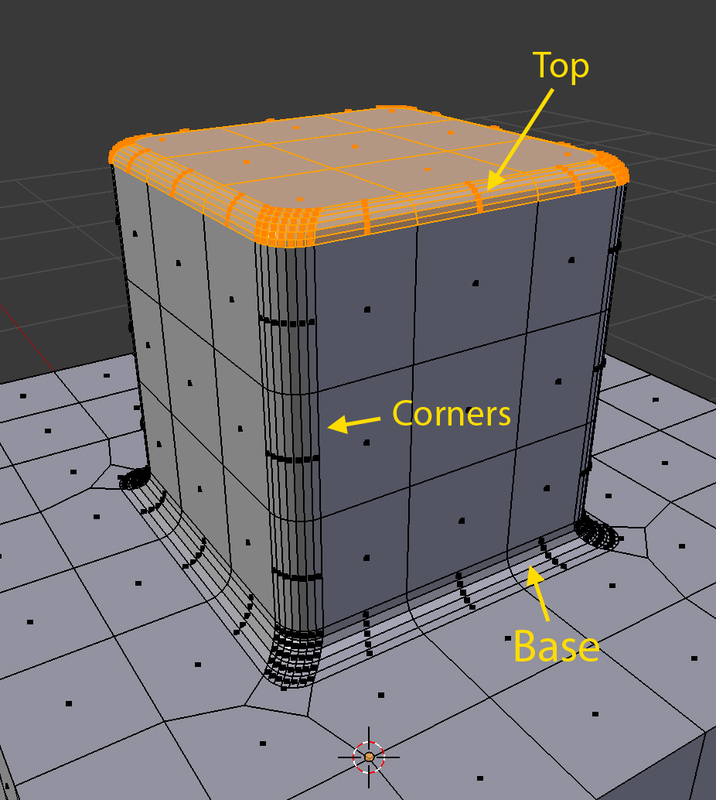 Corners: (0-1) the strength of the bevel modifier's effect on the corner part of the extrusion. Top: (0-1) the strength of the bevel modifier's effect on the top part of the extrusion. Side Segments: The number of subdivisions for the side of the bevel. 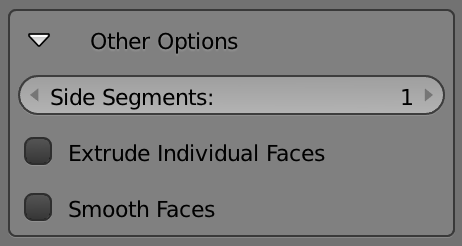 Extrude Individual Faces - When checked, this option allows you to extrude the faces so that they follow an individual extrusion path. Smooth Faces: Add smooth shading to the resulting extrusion. Move the mouse back and forth to change the height or depth of the extrusion. If you have any issues or questions, don't hesitate to contact me through this website or on Twitter. 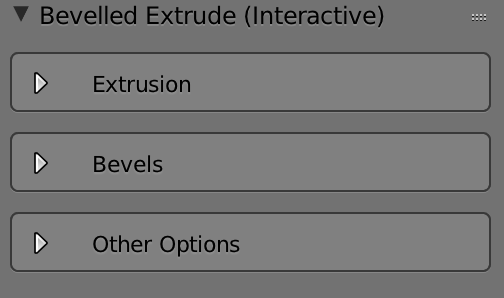 When I enter edit mode I do cannot see the menu option for Bevelled Extrude. What's wrong? Make sure you are in Face Edit Mode. As the Operator works on faces, the option is only available in that mode. I have a new feature suggestion or issue with the add-on. How do I contact you? I would welcome you contacting me through this website, visiting www.markkingsnorth.com, or through Twitter. i like your addon. Nice. What this addon does is pure magic time saver and lessen your headache. Selective working program. Tried installing it on my main laptop but blows up due to some python error. Installed on my Surface Pro 3 with the same setup, works fine. No support when reporting the issue, not sure why thre is an install problem. Hi Bryan, Sorry you’ve had problems. I did not receive a message in my inbox? Try selecting the ‘contact the creator’ button again and I’ll see what I can do. This is one of the best blender bevel tool i have ever used, i love it. No problem, thanks for the rating as well! Brilliant! It used to take me ages to do this sort of thing, it really bugged me. Really very usefull and reasonable price! I really appreciate this product. It performs as advertised and I cannot wait to use this on my next project. This is a get-it-done add on. Simple to use, saves a ton of time, does just what it said it would do. Good to hear - hope the new interactive mode will be useful to you. I love this tool so much. It's so useful and convenient. Thanks so much for the review! Glad it has saved you time.